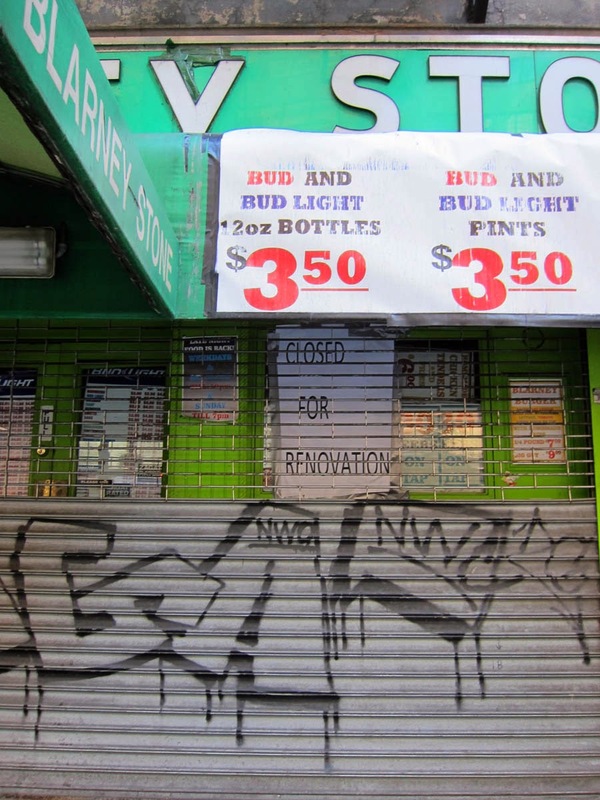 "What the World needs most in these troubled times — more than a better mousetrap, more than a good ten-cent cigar, even — is a guide to some of the most distinctive bars in New York City. I mean the kind of real inside dope that only Grade "A" Fancy magazine can provide. Naturally, if this vital scuttlebutt could be conveyed to a grateful public in the form of a handy map, one with the eye-pleasing design sense Herb Lester Associates is famous for, well, that would just be so much gravy!" Sure, we've all ruminated along these all-too-familiar lines through countless sleepless nights. But it has always seemed too idealistic, too quixotic, a chimera more than a real world possibility. 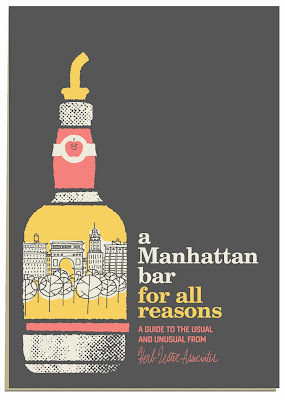 As if in answer to your prayers, A Manhattan Bar for All Reasons is now available on the web and at select retailers. With this guide Grade "A" Fancy adds a third New York City title (along with Truly Greenwich Village, and Writing Manhattan) to our collaboration with the aces at Herb Lester Associates. The map steers the reader to a wide variety of bars, taverns, cocktail lounges and gin mills in the Big Town, each with its own unique charm. These locations were chosen not merely because they’re great places to quaff a drink but because there is something out of the ordinary about each: that could mean a location, an object or perhaps an activity, and joints suitable for an eye-opener, a quick one, or a digestive tonic. The design of this map is by Jim Datz. You'll dig it. Herb Lester product is available on the web and at smart stores around the world. In New York City that includes Bookmarc, Flight 001, Eventi – a Kimpton Hotel, McNally Jackson Books, The New York Public Library Shop, and the inimitable Strand Book Store. Hot dog! We’re pleased as punch that a brand new book, Repast by Michael Lesy and Lisa Stoffer, has found its way to the Grade “A” Fancy mailroom. Shall we take a quick peek inside? 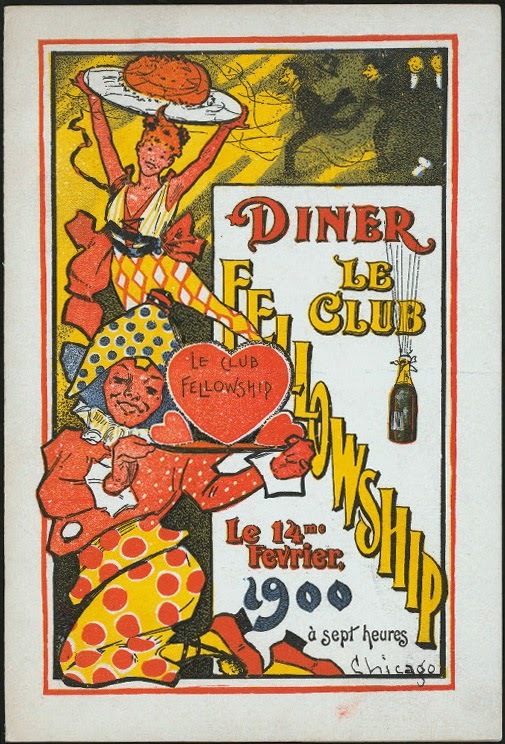 As indicated by the book's subtitle, Dining Out at the Dawn of the New American Century, 1900-1910, the focus is on the first decade of the Twentieth century, a time of immense social and political upheaval, examined via all aspects of the food biz; from canning and meat packing, and the beginnings of sanitary standards for those industries, to the many evolving options, high or low, exotic and workaday, for eating outside of the home. 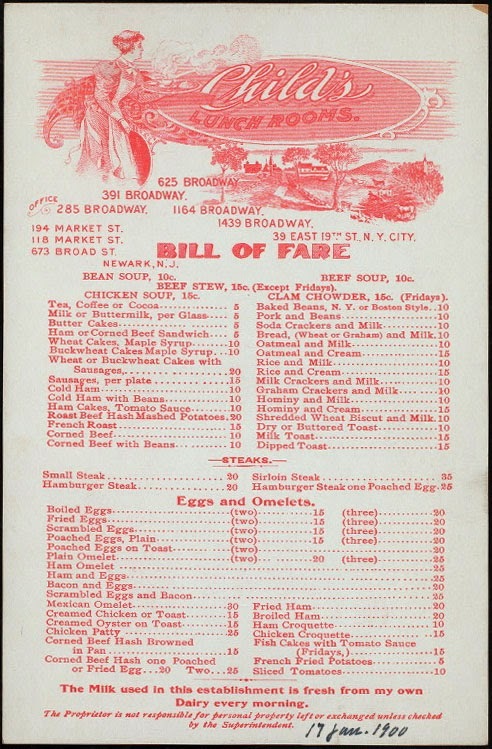 The inspiration for Repast was the Buttolph Menu Collection in the Rare Books Division at the New York Public Library. The collection, assembled from 1851-1930 by the delightfully named Miss Frank E. Buttolph, provides a good portion of the images in this handsome, well-designed volume. 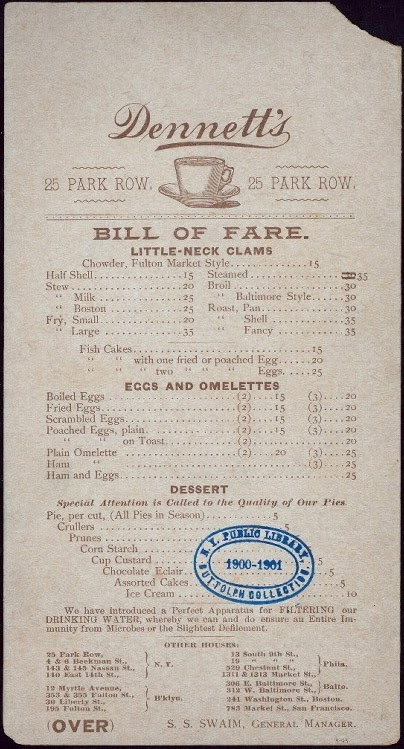 Some menus are ornate, some utilitarian, all are a fascinating glimpse of a past that can be simultaneously familiar and alien. Reading the menus can make us pine for the days of abundant shellfish (Little Neck clams thirteen ways at Dennet’s on Park Row, for instance), and pie, pie everywhere. The text exposes real world workers’ conditions and the strikes that followed, the “embalmed beef” scandal of the Spanish-American War and attention to purity of food after the reports and subsequent government intervention. You will discover the fashion for sanitary-appearing restaurants, such as the Child’s chain, with its gleaming tile, bright lighting and nurse-type waitresses’ uniforms, the result of a proto-Bloombergian anxiety over cleanliness. There are chapters on new methods of serving lunch quickly to office workers, and how the emergence of women as customers and proprietresses brought new styles of eating places. All enormously curious, mouth-watering helpings of American history. Perhaps it’s true when they say that the way to a historian’s mind is through his stomach. 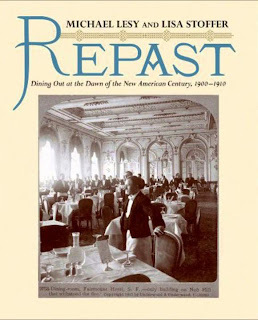 Repast~Dining Out at the Dawn of the New American Century, 1900-1910 was written by the team of Michael Lesy and Lisa Stoffer, university eggheads from Massachusetts, released 10-28-13 by W.W. Norton & Co. (not our Norton Records/Kicks friends, and not the Malbec wine producers in Argentina either, just so you know.) 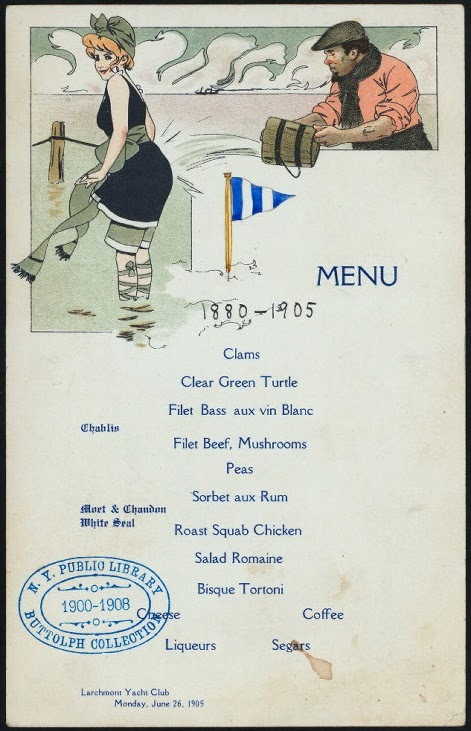 The menus shown here were cribbed from the NYPL's Buttolph archive online, and all can be found among the many delicious plates featured in the book. Yesterday was Tuesday, and to celebrate, your Grade "A" Fancy correspondents had dinner at one of our favorite places in town, Le Veau d'Or on East 60th Street. High time we did, too – I'm afraid we have been neglecting it for too many months. We really deserved a scolding, or maybe a Gallic snoot, but this being Le Veau d'Or, no matter how infrequently we dine here Madame makes us feel like (rather important) regulars. Settled into a banquette, we noted with approval that nothing beyond a fresh coat of paint had changed since our last visit. That is the whole point of eating here: always the same attractive room, same gracious service, same old-fashioned menu. Its dependability, unchanging and timeless, is rewarded with customers whose loyalty to Le Veau d'Or is often measured in decades. There is one element missing, of course. Monsieur Robert isn't sitting at his table by the door. It is just over a year since Le Veau d'Or's owner passed away. His daughter Catherine is the steady hand at the helm now, doing an admirable job of making sure the restaurant keeps ticking along in exactly the same way as Monsieur did for 27 years. The customers demand it, after all. 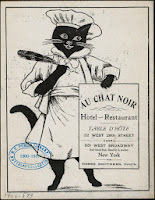 Through a strange quirk of the internet, Monsieur Robert still watches over his restaurant. Lucky for all of us, he happened to be sitting on the bench in front the day the Google Street View camera car chanced to pass. The face is blurred out, but he is unmistakable with his maroon vest and cane. Let's raise a glass to the everlasting charms of Le Veau d'Or, and here's hoping Google never gets around to updating their views of East 60th Street. A true blue original is gone. 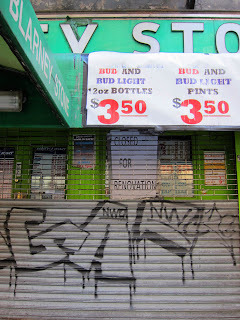 It opened in 1952 and, spawning dozens of imitators, practically invented its own genre of NYC bar, but suddenly the original 710 Third Avenue Blarney Stone is no more, my friends. It was the last of its breed. In its later years the working class shot-and-a-beer joint welcomed craft beers but that changed nothing; cheap drinks, good food in quantity from the steam tray or grill and a horse race on the TV were what the regulars favored. The light was too bright, and the rock music blared, but somehow you stood it — any other way it wouldn't be the Blarney Stone. The ink is not even dry (the ink may not even be mixed) on our latest Herb Lester map, a guide to some of our town's favorite grog shops, and here we have one more rewrite, one more heartbreak, one more greed-induced blow, making the city a little less interesting for the sake of … what? A buck? Progress? We can't figure it, and the people responsible will never be able to explain it to us. The gates came down and an ominous “under renovation” sign went up about a month ago, but we had hope, since the nearby Muldoon’s was actually being renovated. But then there was a note for the tenants of 710 Third regarding keys from the “new owners,” and the NY Real Estate Journal reported the property had been sold to the troubled McSam Hotel Group. That the plug was pulled on the Blarney by the new owners was confirmed by the affable lunchtime bartender at Muldoon’s, where the scent of new varnish lingers, but doesn't discourage the customers. We’ve really not yet recovered from this and here comes one more thing to make your blood boil, for yet another Duane Reade is soon to bully Third Avenue, this time at what was Avenue, a ladies’ wear shop, in the highrise on the northeast corner of Third Avenue and 44th. This will make five outposts of the chain in four blocks. Not only is there another across from Grand Central at 42nd & Lexington but one can stand at the corner of Third and 42nd, across from the CVS, and have your left eyeball on the Third & 41st location and the right on the one at Third & 43rd. Really, what else could we want from Fun City? We took a longer look at the glory that is the Blarney Stone in this back issue of Grade "A" Fancy. Read it and find out why this closing really is tragic. Delmonico: What's in a name? 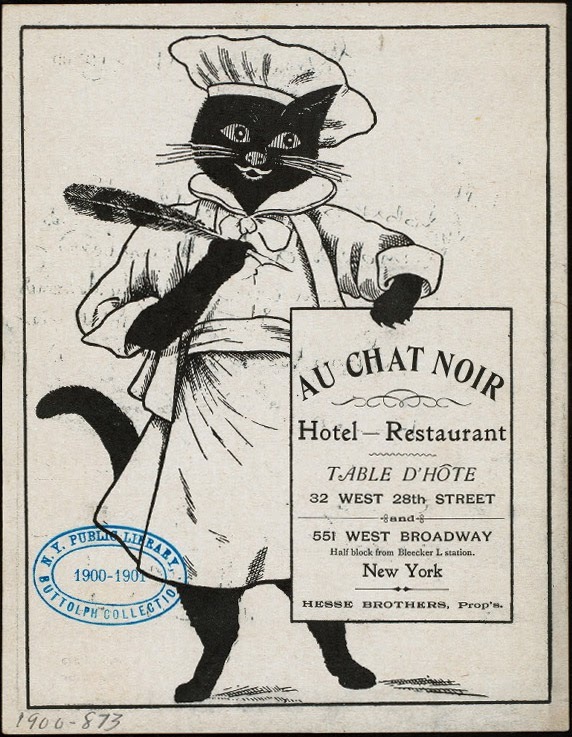 Here's the story of how the brothers Delmonico introduced the idea of fine dining to America. More than just a restaurant, their name would become a synonym for deluxe. A New Map! A New Page! Extra! Extra! There's a new map from the good people at Herb Lester Associates called Writing Manhattan, a guide to literary locations in the borough. We wrote it and designed the map. A lot of research went into this little baby, but because of the constraints of space, many choice bits were left on the cutting room floor. It is bursting at the seams with 78 fascinating entries, if you can believe it, but we still couldn't cram in all the goodies we collected. In some cases we found too much material on an author and had to make a hard choice on what to include; other writers had to be left out entirely. So we thought it would be fun to make an appendix to Writing Manhattan. Click on the Writing Manhattan tab above to see the extra material, and then go buy the map.